Have you noticed how many unexpected changes have occurred in your daily life since last year, Capricorn? 2012 is a year of service, kindness and going with the flow. With Pluto in your 1st House of fresh starts and power, you might have seen some of the themes that came, courtesy of this misunderstood planet that plays a HUGE role when and wherever it falls in your chart. In your 1st House you might have had to tear down in order to rebuild in one area of your life. There will be major achievements and obstacles you will encounter during this transit. It might seem like if it isn't something, then it's something else. Balance will be important in 2012 as you adjust to some major domestic changes. Let's take a closer look. As the year opens, your ruling planet will transit Libra - your 4th House of home and family and then it will enter Scorpio and your 5th House. Jupiter, planet of growth, abundance and expansion will begin the year in Taurus for an extended stay until mid summer. During this time, you can expect your love life to run smoothly and feel a deep connection to a special relationship. Children, romance and what you enjoy doing for fun and pleasure will be highly emphasized and have a prosperous, fortunate feel to them. You could begin a family, have another child, become more involved with children and you won't want to miss out on the professional offers that come your way. The signs of Taurus and Libra will play roles in some of the above mentioned areas but are most likely connected to you through love or work. On 6/13, Jupiter will then enter Gemini and you will begin to notice the emphasis shifts to friends, your hopes and wishes and how to find and live the ideal life you want. You CAN find it this year, Capricorn! If you can imagine it, you can create it. A creative project you may have had in the back of your mind could become a reality and really take off. The sky is the limit in 2012 with the assistance of Jupiter. The other big events are the planets of Neptune and Uranus changing signs. Last year Uranus entered Aries in March and created a tense angle to your Sun sign. Remember that this is going to be challenging when it comes to your interactions with your family, where you live now and where you might be living in the future. This is your House of home and family. So before you blow a fuse or if situations escalate and conversations become heated, stop, think and remember that kindness and honesty never fail. Mix in a little tact and you can avert some stressful situations in your home. Whether these are family issues or a recent change in your home, it will be imperative that you go with the flow. Uranus (who comes up with these names?) represents surprises, and some things you never thought possible can happen under this dominating transit. You could feel pressure, stress and a strong powerful undertone in the air but you will learn how to navigate these intense feelings, even though you might get occasionally down. You will learn to accept that which you cannot change and learn that surrendering to whatever occurs is your best route to take. Bottom line, Capricorn, your family life will be filled with unexpected events and a possible relocation. Get used to the idea of major surprise where your home and family life are involved. Take a closer look at the 4th House to see where you can expect to encounter the unexpected! 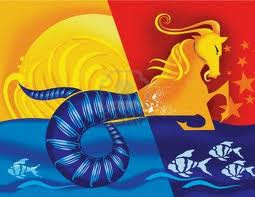 Neptune will enter Pisces in February and Pisces is a more compatible placement for you than Aries energies tend to be. You will notice a shift in February as this planet forms a harmonious angle to your sign and can make your daily life run more smoothly and efficiently. This transit prompts you to look more seriously/internally into the idea of higher education for a specific reason and you could find yourself and your worldviews are slowly but surely changing. You will find a spirituality or spiritual views that you feel you are in complete alignment with. This is also a great time when you can strengthen friendships, find deep meaning in them and form even stronger bonds with those from your past and present. This is your year to establish new routines that suit YOU better. This will be a year where you learn to manage how to effectively handle a hectic schedule when love, family and other responsibilities collide. You are ruled by Saturn and your resilience is what keeps you young at heart and gives you the power to overcome anything or anyone who trespasses on your territory. Where love is involved, a serious relationship is on your agenda, single or coupled. Singles will have their choice of potential romantic matches while couples grow closer through trials and other adjustments that revolve around home.